I have a problem with snacks. A problem which needs to be solved. Solved using science. Science and math. 'kay, so allow me to elaborate. When it comes to doing thing in the kitchen, I have no problems. When that thing becomes things, plural, I start developing problems. In that I can't do them at the same time, I always end up doing them sequentially. Like a computer from before about 1990, I am chronically incapable of any kind of multitasking. Parallel processing? HA WHAT'S THAT. Specifically? I can't make toasted sandwiches and tea at the same time. And since both these things need to be, y'know, hot, I have a problem. But never fear, a solution is at hand. It comes in the form of a project network. Thanks to Shenton College's super duper secure intranet! and lets you plot out a series of tasks, based on their prerequisites, dependencies, and time to complete. If memory serves, when constructing a network, you first make a list of all the tasks which need doing, and their time to complete, and their prerequisites. This means I need once again to take to the kitchen with a stopwatch. Each item in the sandwich chain depends on each of the previous ones being completed, and cleaning up depends on everything else being completed, otherwise you have to do it twice, which makes you stupid. So what do we notice here? Firstly, I am far better at making charts than whoever made that other one. I mean seriously. Secondly, the time consuming part of the process is the sandwich. There's a 150 second slackness in the tea-making section. This means I can have 150 seconds worth of delays in the tea making process before it starts to affect my finish time, or alternatively, if I want to absolutely have everything finished at once, I should delay my tea-making start by two and a half minutes. Thirdly, not everything on the list requires my constant attention. Case in point, the kettle boiling. * Having made this chart, what I need to do is list the start times of when I need to take each action. As you can see, we've gained 30 seconds. This is because there's only one of me, and no matter what happens, I'll have to interrupt sandwich prep to do cup prep. This effectively adds 30 seconds to sandwich prep, for the pause, and 30 seconds to the tea delay required for simultaneous completion. 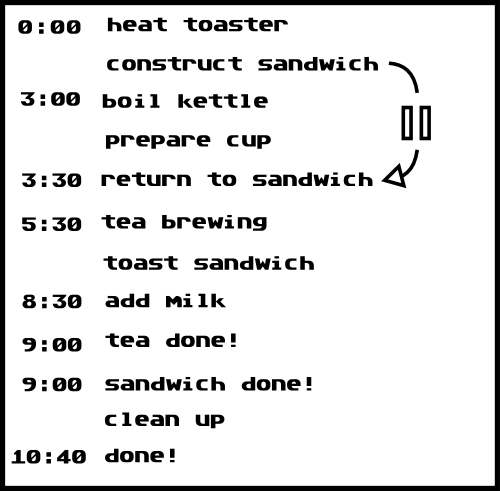 All the other tasks either don't overlap (adding milk) or are trivial (pouring the boiling water). Were there more than one person doing the job, you could feasibly get it down to 10:10, but the extra 30 seconds doesn't really bother me. Now I think I'll print these out and stick them next to the kettle. I suggest you do the same. 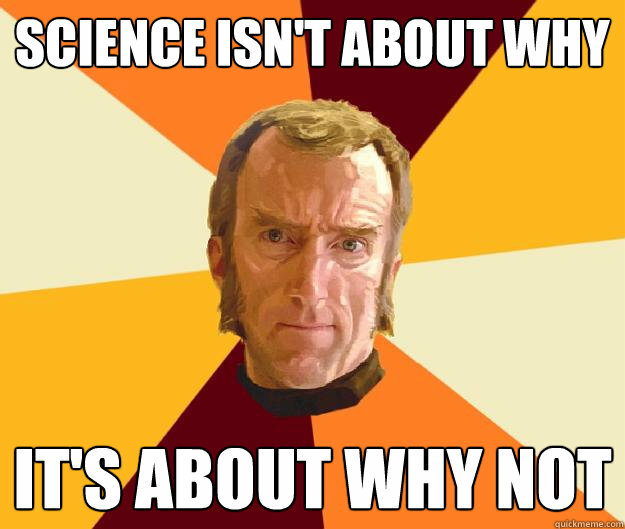 For science. *In fact, should the proverb hold true, I should deliberately not pay attention to it if I want it to ever boil at all.